It’s been a funny old week. First the storm and a day without power, then yesterday my first serious car crash. I suppose, after 40 years of driving it had to happen sometime. I popped out from the new house to get some lunch and as I was driving along a car came towards me in the middle of the road. I pulled in as far as I could and slammed on the brakes hoping the driver would pull over but they (I will not mention details at this moment) just drove into me. The next thing I knew I was in a car full of dust from the air bags, in a state of shock. That was the bad news. The good news was that I was able to open the door and walk out. If I had not pulled hard to the left and the car had been hit head on or more at the side the result could have been far worse. 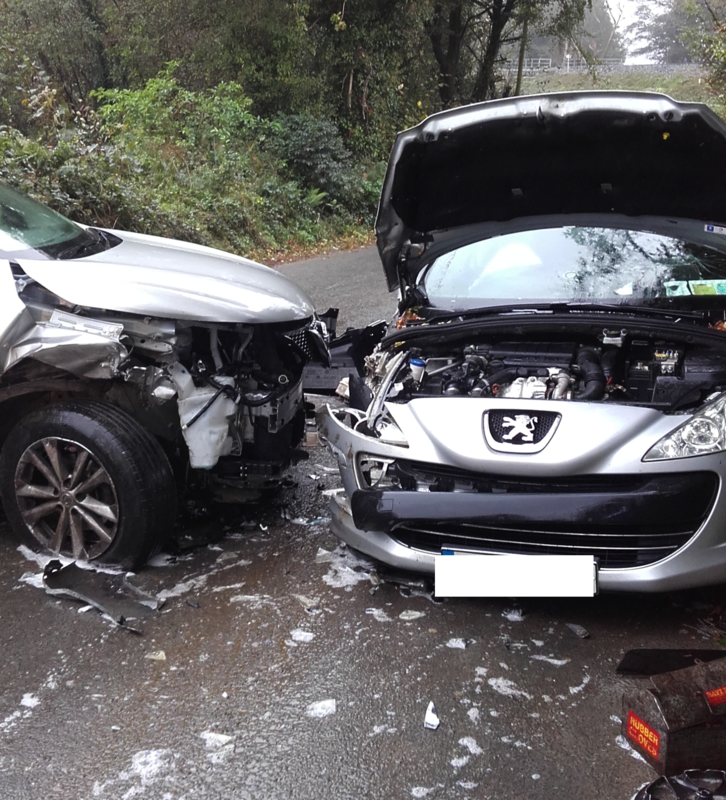 I have to thank the drivers who were at the scene who phoned the Garda – I didnt know who to phone – and also the Garda and the Fire Brigade and Ambulance crew. I was unhurt apart from some friction burns and some aches and bruises now but will check with the doc tomorrow. And thanks to Peugeot for making a sturdy car! Quite how this happened is a mystery. What makes a driver drive down the middle of the road and not brake or swerve? The road is perfectly wide enough for two vehicles. I have my ideas but this is not the place for me to speculate, as the insurers and Garda will know more. Yesterday was the day my card was numbered. If I had set off five minutes later the accident would not have happened, if I had been five seconds later it might have been worse. I am just relieved to have walked away with just a few scrapes. If you ever think that seat belts are not worth the effort, think again. And if you think it is fine to fiddle with anything other than the controls of your car while you drive – then you are a fool. Good grief! Thank goodness you were relatively unhurt! As you say, minutes either way could have made quite a difference! And thank goodness you weren’t on your bike – although you might have been better able to avoid it ! Definitely not your week! Wow that’s too close for comfort.. we can all imagine what the driver was doing !!!!!! So glad you are ok ish…. take care. Sue. So glad your’e otherwise OK! Drink, drugs, asleep, phone or a combination. A warning reminder to us all. I hope you’re fully ok soon.